Dr. Right is a great inventor. He has created robots such as MegaMan and MegaGirl as well as lesser creations. 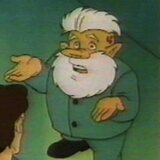 His arch-nemesis is Dr. Wily, one of Mother Brain's henchmen.